Like all longtime Wodehouse fans, I greeted the news of the B.B.C.‘s 2013 Blandings Castle adaptation with much joy. I thought, mistakenly as it turned out, that Wodehouse’s stories would be treated with the right kind of reverence, that the characters and their idiosyncrasies would be handled with the same loving care that they received at the hands of their author. 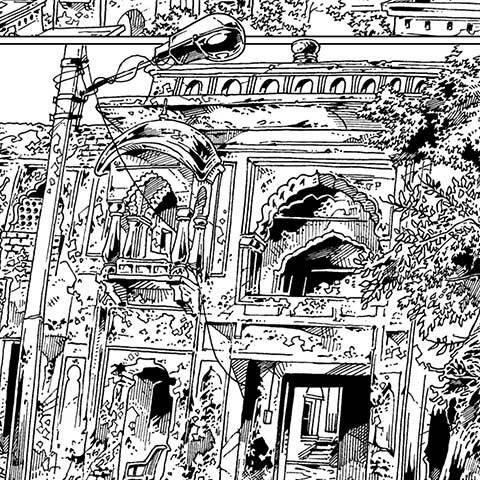 Instead, what we got was a clumsy rendering of one of the most magical places ever created in fiction. Blandings was not that Garden of Eden which we love so well, but instead became a place where comedy means a doofus driving his car into a tree. 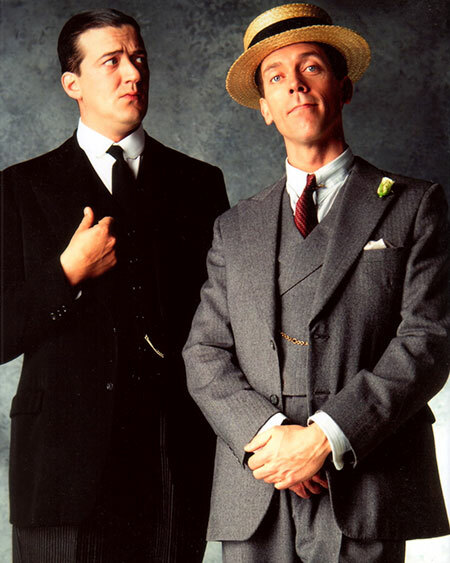 Stephen Fry and Hugh Laurie as Jeeves and Wooster. You can’t quite translate the priceless comedy of that line to the screen—big or small—and most Wodehouse stories simply wither and die when they’re adapted. It was so in the case of an execrable movie called Picadilly Jim (with Sam Rockwell as Jim, for heaven’s sake) and it is so in the case of Blandings. One notable exception to this rule is the I.T.V. show Jeeves and Wooster, starring Stephen Fry and Hugh Laurie, in the respective title roles. The show ran from 1990 to 1993 and made quite a few changes to the original stories. For instance, the setting for the Pearls Mean Tears episode was changed from the French seaside resort of Roville-sur-Mer to the English seaside town, Westcombe-on-Sea. Corky Corcoran, the narrator from the Ukridge universe, never meets anyone from the Jeeves and Wooster universe in the books and is still introduced as a minor character on the T.V. show. Also, a number of characters, even the supporting ones such as Aunt Agatha, Madeline Bassett, Aunt Dahlia, and Bingo Little, were played by multiple actors over the four seasons. Nevertheless, I stand by the show for one reason: they kept the spirit of the stories intact. What exactly do I mean by that? Just that the makers of Jeeves and Wooster showed respect for Wodehouse’s unique genius by keeping much of the dialogue the same as in the books, and by making sure that at least the principal characters—Jeeves and Wooster—look like how Wodehouse described them. One of the biggest problems I have with Blandings is that Timothy Spall is so patently NOT the Lord Emsworth of Wodehouse’s imagination. In a memorable passage from Full Moon, the absentminded peer is mistaken by his brother-in-law, Col. Egbert Wedge, to be a pair of overalls draped over the fence of the Empress’s sty. Could anyone ever make a similar mistake about Spall? I think not. But getting back to Jeeves and Wooster and why it works as a television show. The writing is largely faithful to the original stories, with creator Clive Exton realising that what is already perfect cannot be improved. A few minor tweaks are all that the stories needed, so that they would fit the television format. And as already mentioned, the cast is perfect, because Fry’s Jeeves, with his heavy-lidded eyes and authoritative bearing, looks so much like the Jeeves of our—and Wodehouse’s—imagination. Ditto Laurie’s Wooster, with his bulging eyes, happy grin and general chinlessness. The two actors share great chemistry and are Wodehouse fans themselves, so those factors help as well. Not to mention the fact that they’re both great comic actors, having worked together in such masterpieces of television as A Bit of Fry & Laurie and Blackadder. Of course, everyone has their own perfect Jeeves and Wooster. I can’t see anyone but Fry and Laurie in those roles. My dad, when I recently showed him clips of the I.T.V. adaptation on YouTube, remained unimpressed. He, in turn, has fond recollections of the slightly less gormless Bertie Wooster as played by Richard Briers in the B.B.C. Radio 4 series, What Ho, Jeeves!. But when I heard clips of the show on Grooveshark recently, I found myself comparing him to Laurie, to the latter’s advantage. I suppose there is no pleasing a fan. ‘Big Books, Small Screen’ is a series of articles that examines books and the television shows they inspire. It is more than the exploration of a pop culture phenomenon: it is an excuse for the author to watch unlimited T.V. By Aashim Tyagi · Easy to make and sufficiently fancy-looking, this dish is guaranteed to win people over. By Aditi Dharmadhikari · Electronic dance music is (thankfully) no more just a bastion of the West. 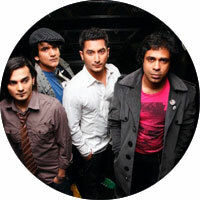 Here are some established names as well as some upcoming artists from India who will be a part of Sunburn 2011. By Sanchari Sur · Nascent pictographs created from the controlled symbiosis of needle and ink on nothing but bare skin hold a certain allure for this writer.